FIFA World Cup 2014 Brazil: LiveU video transmission. 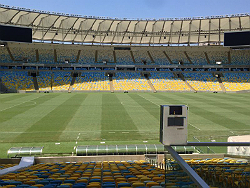 Hackensack, NJ, May 2014 – LiveU (www.liveu.tv), the leader in portable live video acquisition, contribution and management solutions, has revealed the scale of its technology and service support for customers at the FIFA World Cup 2014™ in Brazil. Over 200 LiveU units will be deployed in the 12 host cities across Brazil by media companies from over 30 countries. LiveU units will offer live video transmission, as well as hot spot connectivity via the new LiveU DataBridge solution, which turns any LiveU unit into a bonded cellular hotspot for any kind of Internet usage on any device. LiveU’s support team will be on the ground in the different locations, offering onsite 24/7 support in multiple languages during the tournament. LiveU already has a strong reputation in coverage of high-profile global sporting events, having initially made its debut at the 2008 Beijing Olympics with NBC. LiveU subsequently deployed over 30 units at the 2010 World Cup in South Africa and over 150 units at the London 2012 Olympics, and had strong presence in the Sochi and Vancouver Winter Games. During the 2013 FIFA Confederations Cup in Brazil, dozens of LiveU units successfully transmitted from numerous host cities across the country. During the FIFA World Cup 2014™, LiveU will provide onsite support at all the main venues in Brazil both directly and through its local partner, UCAN Digital Transmission. LiveU will deploy its entire portfolio of uplink solutions including its backpack and camera-mount cellular bonding devices such as the LU500 and its signal boost Xtender external antennas. According to Eldad Eitelberg, Director of UCAN, LiveU units are easy to operate and will help Brazilian and foreign journalists to be fast as they can, “with just one camera and a backpack, the information arrives to its destination quickly”, he said. Customers will include global sports and news networks, news agencies, local stations, and online broadcasters from almost every participating country in the tournament. All units in the field can be controlled directly by the operator, or remotely from the studio in the home country via the browser-based LiveU Central management system. TERRA, the largest Internet company in Latin America (NASDAQ: TRLY), will use LiveU technology during the World Cup. Allan Pessoa, Technology Manager with TERRA, said, “Our goal is to be very dynamic, delivering great content with solid facts. LiveU provides us with the mobility and technology to do that.” The content will be available on TERRA’s web site (www.terra.com.br) for multiscreen viewing. TERRA and UCAN expect to reach more than 80 million people in Latin America by using LiveU solutions.